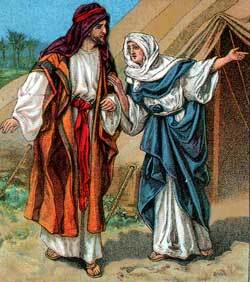 Rebekah plots with Jacob to take the birth-right from Esau. 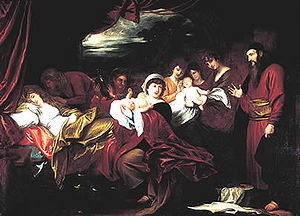 AFTER ABRAHAM DIED,his son Isaac lived in the land of Canaan. Like his father, Isaac had his home in a tent; around him were the tents of his people, and many flocks of sheep and herds of cattle feeding wherever they could find grass to eat and water to drink. Among the people in those lands, when a man dies, his older son receives twice as much as the younger of what the father has owned. This was called his “birthright,” for it was his right as the oldest born. So Esau, as the older, had a “birthright” to more of Isaac’s possessions than Jacob. And besides this, there was the privilege of the promise of God that the family of Isaac should receive great blessings. Then Esau made Jacob a solemn promise to give to Jacob his birthright, all for a bowl of food. It was not right for Jacob to deal so selfishly with his brother; but it was very wrong in Esau to care so little for his birthright and God’s blessing. Some time after this, when Esau was forty years old, he married two wives. Though this would be very wicked in our times, it was not supposed to be wrong then; for even good men then had more than one wife. But Esau’s two wives were women from the people of Canaan, who worshipped idols, and not the true God. And they taught their children also to pray to idols; so that those who came from Esau, the people who were his descendants, lost all knowledge of God, and became very wicked. But this was long after that time. Then Jacob went and brought a pair of little kids from the flocks, and from them his mother made a dish of food, so that it would be to the taste just as Isaac liked it. Then Rebekah found some of Esau’s clothes, and dressed Jacob in them; and she placed on his neck and hands some of the skins of the kids, so that his neck and his hands would feel rough and hairy to the touch. All this came to pass many years afterward. The people who came from Esau lived in a land called Edom, on the south of the land of Israel, where Jacob’s descendants lived. And after a time the Israelites became rulers over the Edomites; and later still, the Edomites made themselves free from the Israelites. But all this took place hundreds of years afterward. It was better that Jacob’s descendants, those who came after him, should have the blessing, than that Esau’s people should have it; for Jacob’s people worshipped God, and Esau’s people walked in the way of the idols and became wicked. This entry was posted in Discipleship and tagged Abraham, Canaan, Christ Jesus, Esau, God, Isaac, Jacob, Rebecca, Rebekah, theology. Bookmark the permalink.